AWS is credited with creating the IaaS public cloud market with the launch of its Simple Storage Service in 2006 and because it was first to market, it got a head start on competitors. Today, Gartner says that AWS is the most mature provider and because of its breadth and depth of features it is the natural choice for the widest range of use cases. AWS has built out a global footprint of 16 regions with 42 Availability Zones (each region has at least two AZs, which consist of one or more discrete data centers). Last year Gartner estimated that AWS has more compute capacity in its cloud than its competitors do combined. AWS boasts a plethora of features, from compute (Amazon EC2 virtual machines, EC2 Container Service, LightSail for virtual private servers, to the Lambda Serverless computing platform), storage (S3, Elastic Block Storage, low-cost archival Glacier) as well as databases (Aurora, a relational database, to Amazon RDS for MySQL, PostreSQL, Oracle, SQL Server, and the NoSQL database DynamoDB, among others). It also has a range of networking, mobile application services, messaging, and business productivity tools, along with an Internet of Things platform, game developer products and desktop and application streaming services. In addition to this broad platform of products and services, AWS also has the largest marketplace of third-party cloud products and services. Perhaps AWS’s biggest weakness is that it is a big platform, and a completely new model for most organizations that use it. It takes time to learn about how to best use AWS, and many times requires organizations to pay for experts to help them, either from AWS or a third-party consultancy. Simply lifting and shifting existing enterprise apps to AWS is not a natural process for many and it requires some rearchitecting. Also, AWS’s granular pay-as-you-go pricing model has its advantages for short-term computing needs, but can be complicated and potentially expensive if used inefficiently. AWS offers a range of discounted pricing options, such as reserved and spot instances, but figuring out exactly how much of those to buy can be tricky. From a technical standpoint, AWS is constantly innovating, which is a good thing for the industry, but can make it difficult for customers to keep up with all the changes. AWS also has some finicky rules about service-level agreements – for example workloads must be backed up across two Availability Zones to get credit for an SLA, and that can be an added cost. 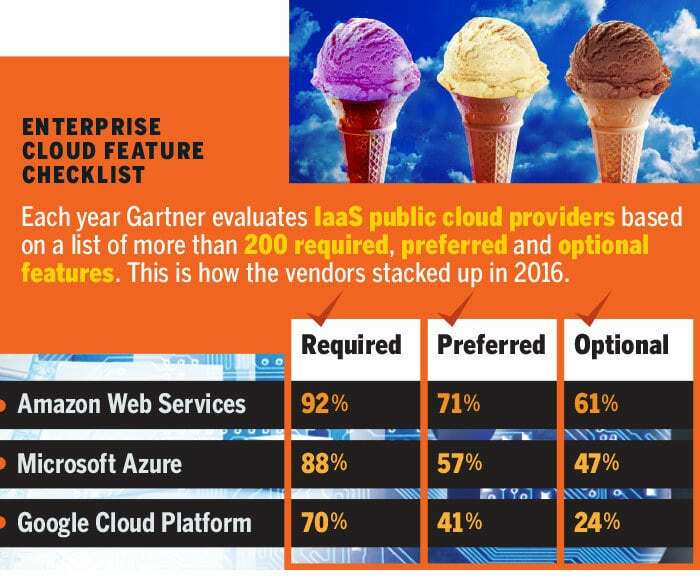 Despite all these challenges, AWS has emerged as the “safe choice” for using the cloud, Gartner says. Microsoft Azure began as an application development platform as a service (PaaS), but has grown into a wide range of integrated IaaS, PaaS and SaaS services. Perhaps Microsoft’s biggest advantage in the cloud is that it has strong relationships with so many enterprises. As customers migrate to the Office 365 SaaS platform, for example, Microsoft will offer discounted use of IaaS virtual machines and storage as part of the Enterprise Agreement. 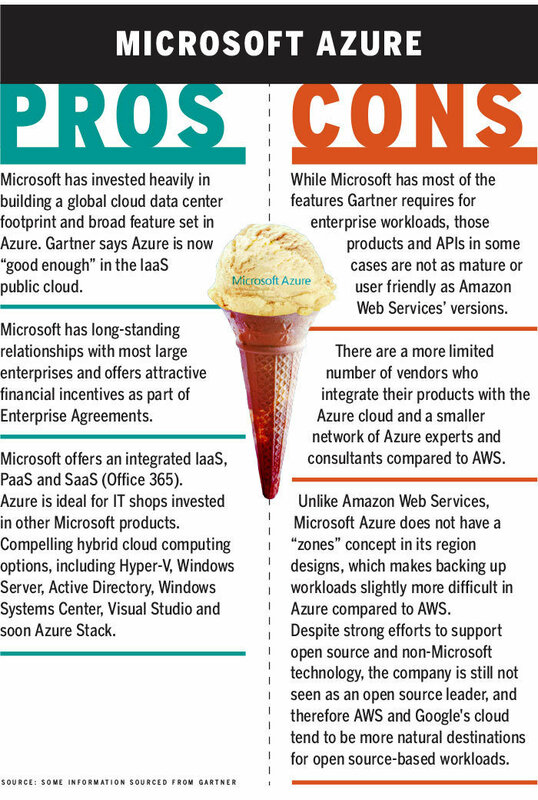 In terms of features and functionality, Azure is at relative parity with AWS, according to Gartner Research Director Elias Khasner. Its compute offerings span from Windows and Linux virtual machines to an Azure Container Service to a serverless platform named Functions, along with a Batch processing service and Service Fabric, which is a platform for linking microservices-based applications. Microsoft has a variety of storage offerings too, from its Blob object storage service to its persistent Disk storage for VMs. Azure has multiple database offerings, including managed relational SQL databases and the DocumentDB NoSQL database, as well as data management tools like its Data Factory and Redis Cache platforms. Azure has its own IoT platform, security and access management platforms, developer tools and monitoring and management products. 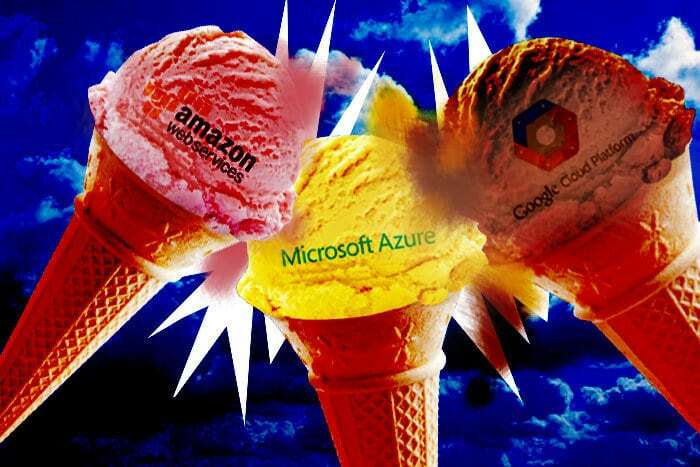 Microsoft is attempting to differentiate itself from AWS by focusing on hybrid cloud computing. To this end, Microsoft has Azure Stack, which is meant to be an on-premises version of the Azure public cloud that customers can run on hyperconverged infrastructure in their own data center. 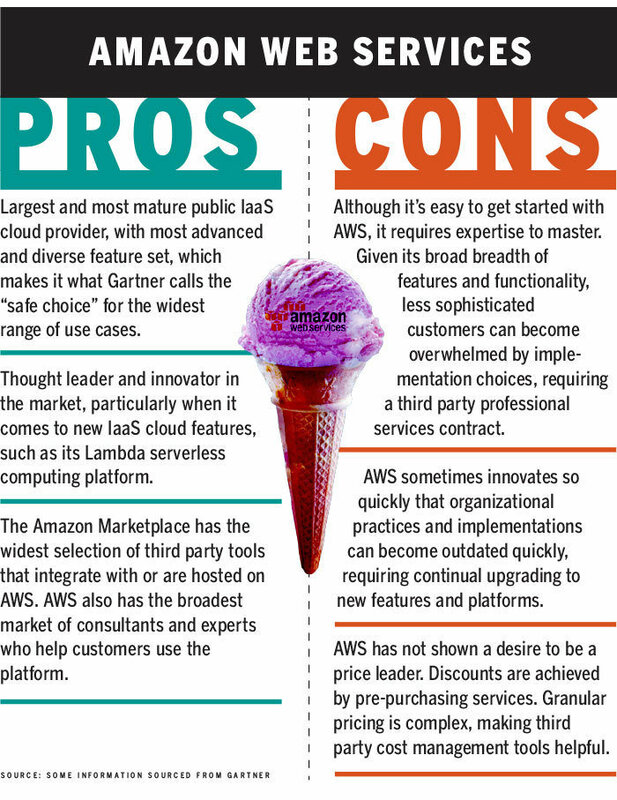 Because AWS beat Azure to the market, most analysts agree that AWS has a more well rounded cloud offering with easier-to-use functionality, and a broader depth of product offerings (especially when you take into account all of the products offered on the AWS Marketplace). In the 2016 Magic Quadrant for IaaS, Gartner says that the Azure APIs and documentations of its products are sometimes more difficult to use compared to those from AWS. Azure, however, is ideal for running Microsoft-based workloads, or running a public cloud component of existing Microsoft applications. The financial incentives the company provides to customers with a Microsoft EA can include free Azure credits for using the platform. Unlike AWS, Azure does not use the concept of Availability Zones. So while Microsoft has a broad and growing international data center footprint, backing up workloads across regions is slightly more difficult in Azure versus AWS. It’s also more difficult to find experts, consultants and third-party platforms that run on Azure. In the latest Gartner IaaS Magic Quadrant, the research firm called Azure “good enough” for most enterprise workloads. 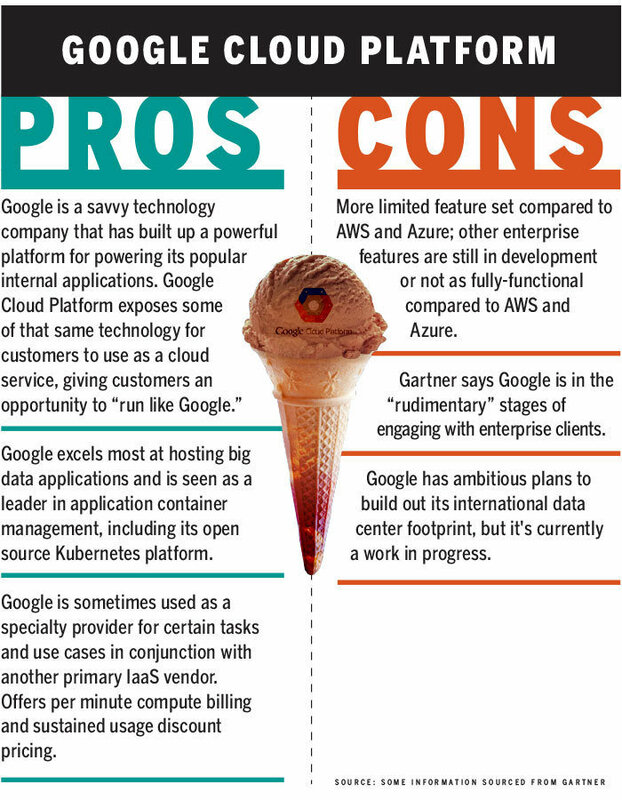 Like Microsoft Azure, Google’s cloud began as a PaaS, but has since expanded to IaaS. Today, it has most of the core features needed to run enterprise workloads, and analysts say it excels at certain specific use cases, particularly around using application containers, big data management and machine learning. The company has a limited global footprint of data centers dedicated for GCP, but it has ambitious plans to increase its data centers for its cloud operations in the coming years. As for features, GCP offers virtual machines, a container engine and registry, as well as a serverless PaaS named Cloud Functions. It’s got an object Cloud Storage service, Cloud SQL plus Cloud Bigtable and Cloud Datastore, the latter two of which are NoSQL databases. Cloud Spanner is a relatively new highly-scalable relational database service. For batch and stream processing, GCP offers Cloud Dataflow, Big Query for data lakes and Dataproc – a managed Spark and Hadoop service. Google’s Tensorflow is seen as a leading open source machine learning platform, while its Kubernetes service is one of the top container orchestration platforms. Google open sourced Kubernetes, so it’s available for customers to run wherever they’d like, or as a hosted service in the Google Container Engine (GKE), which is based on Kubernetes. Like Microsoft, Google has a compelling SaaS strategy to accompany its IaaS and PaaS products, centered around its G Suite of work productivity tools. Instead of enterprise agreement discounts, Google makes its price breaks available through what it calls sustained usage, the idea being that the more a customer uses the cloud platform, the less expensive it becomes per unit of cost. Perhaps the biggest knock against Google is that the cloud is still a work in progress. In Gartner’s annual assessment reports, it found that Google had only 70% of the required enterprise features in its cloud. To be fair, Google is ramping these up. For example, Gartner says that Google doesn’t have as robust role-based access control and user management tools compared to AWS and Azure. Google’s IAM platform is in beta after being announced last year and when it becomes generally available it will give users more access control options. Google also has the longest way to go among the three providers in terms of reaching out and interacting with enterprise clients. This is Microsoft’s strength, and it’s taken AWS almost a decade to build relationships and convince enterprises that it is a trusted partner. Google has made significant inroads here too, especially when it comes to its SaaS platform. The hiring of VMware co-founder Diane Greene in early 2016 has been seen as an indication that the company plans to ramp up its enterprise capabilities. In the meantime, Google is seen as having the strongest platforms for managing large sets of data, and for new application development trends such as the use of containers or advanced machine learning systems. The decision of which vendor to use is not a zero-sum game. 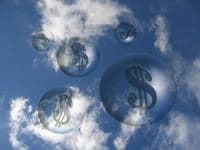 Khasner says the majority of clients he works with are pursuing a multi-cloud strategy and using at least two, if not all three of the leading IaaS cloud vendors, each for certain tasks. Vendor RightScale, which sells a cloud management platform, found that in a survey of 1,000 of its users that 57% were running applications in AWS, with 34% running apps in Azure and 15% running apps in GCP. But there was another wrinkle in that study: 85% of RightScale’s customers have a multi-cloud strategy, which means they’re using public and private clouds together, or multiple public clouds. There are other options in the market beyond the big three, too. IBM, for example, offers a broad array of IaaS public and private cloud options, along with managed services. IBM also has the Bluemix application development PaaS and a variety of SaaS offerings. Oracle, meanwhile, is attempting to create a robust IaaS to join its SaaS and PaaS offerings. Though in the early stages, it is expected to ramp up in terms of features and functionality in the coming years. Alibaba, a Chinese ecommerce provider that has a strong data center footprint in Asia, is expanding into the U.S.
Khasner says it’s important for customers to create evaluation criteria based on their own use cases and find the provider that best matches their needs. Since no one vendor is a panacea, the reality is that most organizations will end up using multiple IaaS public cloud providers.